In February I was privileged to attend this year’s NWC at the Bournemouth International Centre (BIC). Over 3 days key women’s issues were debated and special guests addressed around 1000 delegates. Seminars and fringe meetings also took place in what as usual at UNISON Conferences amounted to a hectic schedule – there’s too much to fit in! UNISON invited delegates to donate to The Red Box Project, a scheme supporting young people affected by ‘period poverty’ one of the subjects on the agenda. Movers of a motion have five minutes to make their case to conference after which other speakers from the floor can speak for three minutes until a vote is taken. This year there was little disagreement and all motions were carried. Nevertheless, it was fascinating to hear the views and experiences of delegates from all over the UK and from a wide variety of backgrounds. Addressing a 1000 strong audience of can be daunting for first time speakers, but it’s a great way to build confidence and oratory skills! Following approval of the Annual Report the main items included celebration of the Year of Young Members 2019 and low paid workers who make up over 50% of membership. Listening to debates confirmed the great challenges faced by women in the workplace and society (low paid, black, disabled and LGBT women). Women are more likely to be low paid, in part time work or unemployed, to have caring responsibilities and childcare costs. They are also more likely to be in debt and affected by austerity; £7 billion has been cut from social care in England since 2010, and women in Britain earn 13.9% less than men according to the Fawcett Society. The injustice for nearly 4m 1950s women with the state pension changes, were fiercely debated. As one speaker put it, ‘Hell hath no fury like an older woman who’s had her pension stolen!’ A legal challenge is ongoing, fronted by Michael Mansfield QC and a judicial review takes place in early June. Members are encouraged to complain to the DWP. It was agreed that the National Women’s Committee will work to raise awareness, publicise the Backto60 campaign and encourage branches and members to make links with their local group. 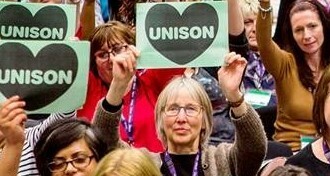 Including supporting action plans to campaign for a fair and effective social care policy and to support women as carers – Unison’s document ‘Bargaining on Carers Policies’ (https://www.unison.org.uk/content/uploads/2018/06/Carers-policies-guide.pdf ) is to be publicised to Branches. A motion identified the potentially discriminatory effect the student loan system has on young women, especially if they take maternity leave. It was agreed this should be investigated and that Unison will work with the TUC and through the Labour Link to raise awareness of the issue. Measures were also agreed to identify the extent of debt issues affecting women more generally and to promote Unison’s ‘There for You’ charity. A series of motions addressed the impact of women’s health issues, including menstrual health, menopause, miscarriage, stillbirth and abortion. Period poverty is recognised as a significant issue for some women and for girls at school. Since this was raised at last year’s Women’s Conference, Scotland and Wales have committed to providing free sanitary products in schools. Conference supported plans to campaign to end period poverty, working with Branches, the National Young Members Forum and The Red Box project to do so. Several motions related to sexual harassment and violence against women – figures show domestic violence and abuse is increasing. Disabled women are more likely to be affected. Already at least 2 women die each week at the hands of current or ex partners. Research shows that domestic violence increases in times of economic recession when at the same time support services including refuges are being cut under austerity. Motions were carried supporting campaigning for greater awareness (Purple and White Ribbon campaigns) and training for branches and stewards in supporting or signposting members affected. Rosie McGregor spoke of the implications of dementia for domestic violence. One motion highlighted the connection between the rise of domestic violence and football and rugby; a significant increase in reporting and hospital admissions due to DV occurred during the 2018 World Cup. A motion was carried to promote the Lincolnshire County Council initiative ‘Ask for Angela’, a strategy to support women who feel uncomfortable on dates to seek a safe way out. Action to support young women to challenge workplace sexual harassment was agreed in the light of under-reporting, ignorance of how to report and fear of reprisals. Campaigning, research, toolkits and greater MP awareness (through the Labour Link) was needed. Other measures were argued for including the reinstatement of Section 40 of the 2010 Equalities Act (third party harassment), extending the 3-month time limit (currently any incident must be reported within 3 months), supporting the ‘me too’ and ‘Time’s Up’ campaigns and providing more information to support Branches. Work with Learning and Organising Services was also agreed to provide specific training for activists on sexual harassment in the workplace and developing workplace policies. Discrimination, abuse and hate crime that occurs specifically against black, disabled and LGBT+ women was a continuing theme at Conference and motions were carried to address these problems. (LGBT+ was carried at conference as a more inclusive name for this group). The Equality Act 2010 is not being fully enforced under the current Government and is further threatened by Brexit. Transphobia is a significant problem – 41% of the transgender population have attempted suicide. Branches need to be equipped to tackle transphobia. Black women are under-represented in senior positions in the workplace, yet are twice as likely to be leaders in their community. There is discrimination on pensions against black women retiring to certain Commonwealth countries. The motion ‘No to Islamophobia’ drew attention to Boris Johnson’s attack on Muslim women, after which there was an increase in assaults. An important issue for all UNISON members. Health and safety, particularly for social care workers very often working in people’s own homes, was debated. Cost cutting, reduced staff levels and inadequate risk assessments make workers more vulnerable to assault. Campaign materials are to be produced on personal safety, risk assessments and challenging managers decisions where necessary. On Health, Safety and Wellbeing, plans were agreed for a website and database for members to access and share information on women’s health issues, policies, campaigning and support groups. Debates in conference and lunchtime seminars explored the amazing and fascinating historical record of women’s activism and achievements in the long (and ongoing) fight for equality. But it is clear how many of the women involved, their actions and sacrifices have been overlooked, despite their role in paving the way to change. Nan Sloane, writer and campaigner, spoke to us about three prominent women, Mary McArthur, Margaret McDonald and Margaret Bondfield, who battled for radial change even against some of the more progressive forces of the time such as the Suffragette Movement. All important stuff and well worth researching – Nan Sloane’s book ‘The women in the room, Labours forgotten history’ is recommended. In the face of ongoing challenges, conference recognised the need for action to support women to take on leadership and activist roles within Unison (Motion 18), and to take up learning opportunities as digitalisation and automation impact increasingly on workers. Inspiring addresses were given by General Secretary Dave Prentis, the fiery Gordon McKay, (President), Christine McAnea, (Assistant General Secretary) and the Labour MP Rosena Allin-Khan who epitomises what a woman with determination can achieve even when the odds are against her. And, representing the striking Birmingham Care Workers, Mandy Buckley told the story of the long running struggle and need for support (see Facebook Birmingham Homecare Workers). So, to conclude, Conference for me was very enjoyable. I learned a lot, had some wonderful chance conversations with delegates and stall holders in the Conference foyer (including the Campaign for Proportional Representation and the Letter Box Library which looks at the problem of gender stereotyping) and had a great time at the Thursday evening disco social. It can be discouraging to hear just how much still needs to change to bring about equality and social justice for women. However, I found plenty of inspiration and hope which made me feel that progress can be made, and the battle is well worth fighting!